First published in 1872, The Expression of the Emotions in Man and Animals was a book at the very heart of Darwin’s research interests – a central pillar of his ‘human’ series. This book engaged some of the hardest questions in the evolution debate, and it showed the ever-cautious Darwin at his boldest. If Darwin had one goal with Expression, it was to demonstrate the power of his theories for explaining the origin of our most cherished human qualities: morality and intellect. Dozens of Darwin reprints are now in print. What makes the Penguin Classics edition special? Introduction by Professor Joe Cain that creates a historical context for this book and provides important bibliographical information. Appendix 1 presents original translations of quotations from French sources used by Darwin in the book. Appendix 2 presents the full text of the questionnaire Darwin sent around the world in search of comparative information about human expression. Appendix 3 provides detailed information about the images specially selected for this edition. Darwin’s own index completes the volume. Darwin, Charles. 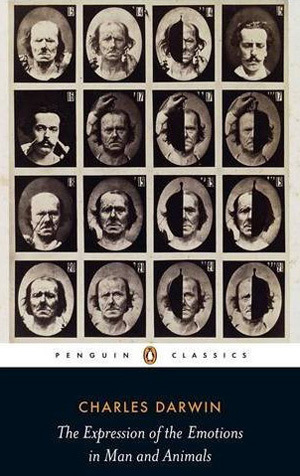 The Expression of the Emotions in Man and Animals (Penguin Classics). Edited by Joe Cain and Sharon Messenger. ISBN 978-0141439-44-0. Don’t forget the photographs! This edition of Expression contains 24 specially selected images from Darwin’s own research collection – images he compiled while studying expression. These survive in his archives and are rarely seen by non-specialists. These images show the range of sources Darwin consulted. They also show the difficulties in studying expression before the age of high-speed photography and controlled experiment.